Eaters: Rise Of The Dead. Presented by cult writer-director-producer Uwe Boll (House Of The Dead; BloodRayne; In The Name Of The King), Eaters: Rise Of The Dead is a smart, stylish and ambitious indie horror movie from first time directors Luca Boni and Marco Ristori. Taking an old-school approach to the genre that thematically and atmospherically recalls the post-apocalyptic terrors of George A. Romero’s classic “Day Of The Dead”, Eaters: Rise Of The Dead combines brains (in every sense of the word!) and gratuitous gore in one neat bloody package that will satisfy even the most demanding zombie movie fans. The world has been devastated by what has come to be known as the Great Epidemic, the result of a deadly global virus deliberately spread by an anonymous psychotic terrorist called the Plague Spreader. Essentially turning its victims into the living dead, the epidemic has produced a Hell on Earth in which even the Pope has committed suicide in order to escape the unfathomable horror. Still surviving the madness going on around them is a small group comprising two zombie hunters, Igor (Alex Lucchesi) and Alen (Guglielmo Favilla), a scientist named Gyno (Claudio Marmugi), and Alexis (Rosella Elmi), a former colleague of Gyno’s and girlfriend of Alen, who is somehow still alive despite being infected by the virus. Gyno believes that Alexis could be the key to finding a cure that could save the human race but for his research he desperately needs “guinea pigs”, undead test subjects that Igor and Alen are more than happy to provide in exchange for food, beer and board at Gyno’s lab. Searching the local countryside for suitable zombie candidates, the two fearless zombie hunters cross paths with an insane artist, a group of neo-Nazis led by a midget Fuhrer, and a mysterious teenage girl who they believe may be the daughter of the Plague Spreader himself. As Igor and Alen routinely risk their lives fighting and trying to capture the undead, unknown to them, Gyno is secretly working to a completely different agenda – one that could have even more terrifying consequences than the problems created by the Plague Spreader. Excellent gore effects, impressively stylish cinematography and a fitting music score (by Justin Bennett of Skinny Puppy and My Life With The Thrill Kill Kult fame and Stefano Rossello of Italian experimental industrial band Bahntier) combined with the script’s very dark vein of black humour make Eaters: Rise Of The Dead a chilling but hugely entertaining ride through a near-future world overrun by zombie flesh-eaters. Eaters: Rise Of The Dead (cert. tbc) will be available on DVD from 13 June 2011. 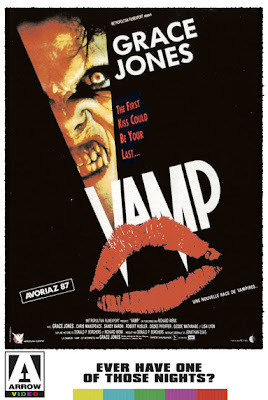 Vamp a personal favourite of mine is finally available on Blu-ray. The 80s were full of films exploring high school and college high jinx, but right from the opening scene Vamp sets it self apart from the others by being genuinely humorous, clever & avoiding most clichés and then the fangs come out. Despite it's relatively low budget values Vamp shines as a genre bending tale. At school, getting into the right fraternity can be a matter of life or death. Keith and AJ need to hire a stripper to entertain the brothers or their college days are over. In a shady after hours joint they find an adult entertainer like no other when they step into the world of sharp-fanged Katrina. Have these two freshmen bitten off more than they can chew? Stuck on the wrong side of town, on a dark night and surrounded by a plague of alien blood suckers... The answer is definitely yes! With a cast including the gorgeous Dedee Pfeiffer and the frighteningly beautiful Grace Jones, this oddball combination of blood, laughs and vampire hotness is a must have for all lovers of the undead.